Walk-In Hours Mon., Tues., Wed., & Fri. 2p-5p or by appointment by calling 515.462.9400. C.R.I.S.P. will guide families to resources to enhance the well being of children and families in collaboration with our community partners. Expected outcomes include, greater family stability, children who are ready to learn, and empowered communities of responsible, productive citizens. Walk-in hours may change throughout the year based on the availability of part-time staff. C.R.I.S.P. is funded primarily by the generosity of local community members. C.R.I.S.P. is also the Prevent Child Abuse Council for Madison County and receives some grant funding to support evidence based community projects (such as Parents as Teachers) in our community. 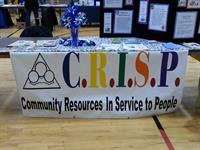 Community Resources in Service to People, C.R.I.S.P., was started in 1995 by a group of teachers wanting to improve the lives of students.